The F1 is a stylish single cell light using a Seoul P4 LED powered by a single AA battery. The F1 is constructed using a aluminium body and reflector and over this another strong aluminium layer with inserts. This makes the light good looking and helps dispate heat. 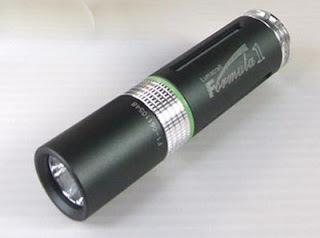 The F1 can use any AA battery including alkaline, lithium, NiMh rechargeable and 3.7v 14550 batteries as well. The brightness is around 60 lumen with a normal AA and might go up to 70 using a 14550 rechargeable battery. The body is very well constructed with knurling near the head and a glow ring that helps finding the light in the darkness after exposure to a light source. The reflector is made of aluminium and produces a very smooth beam. The lens is a saphire window with anti-reflective coating. The light is not regulated it will last for about 1 hour at full brightness and then drop down being usable for about 3 to 4 hours getting dimmer as the battery is consumed. The switch is a twisty, twist to turn on and untwist to turn it off. The total length is 3.39'' (8.6cm) with a hole in the tailcap to add a lanyard or a split ring. The light can stand on its tail for candle mode and surprisingly the head and reflector can be removed to use it as a lantern providing 360 degree illumination in a room. We have the impression that the F1 is a light designed and manufactured with a lot of quality, there are little nice details in terms of design and usability everywhere. It is probably not the Ferrari of AA lights but a good formula 1 car.